Driftwood Shore is a tropical area in Mario & Luigi: Dream Team. As its name suggests, it's a beach area located to the southwest of Mushrise Park and the south of Wakeport. 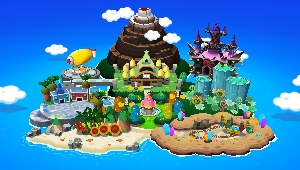 The area is the location of Rose Broquet, the Rainbow Rank shop in the game, a mysterious pirate cavern, and the Mole Hunt minigame. The area's name comes from Driftwood (a type of wreckage found in coastal locations) and the term 'drifting off to sleep' (referring to the moment someone falls asleep). The real world Driftwood Shore is the only level in which a boss is not fought (unless one counts the Fly Guy R Thieves, which are fought at Pi'illo Blimport and are just ordinary Fly Guy R's). This is also the first place where Mario and Luigi fight traditional enemies alongside native Pi'illo Island enemies. 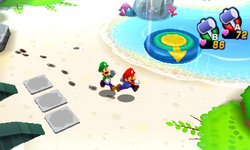 Mario and Luigi first come to Driftwood Shore after escaping Dreamy Mount Pajamaja and returning to the real world. They do this because Princess Peach and Toadsworth had seemingly travelled to the area to avoid Bowser and Antasma's forces. When they arrive in the area, they're directed to Rose Broquet, a high class shop located in the north east of the area. In here, they meet Broque Madame and find that Peach and Toadsworth have disguised themselves as Brocks to avoid Bowser's notice. It's then discussed that Peach should be hidden in the Dream World to protect her from Bowser. The Mario bros then explore the beach for a while and find a portal leading to Dreamy Driftwood Shore, a newly created Dream World area that seems perfect to hide Princess Peach in. They also meet the Dream Genie Seadric, who says that they can expand the Dream World using Dream Eggs, making it easier to hide Peach. However to do this, they'll need to find his brothers and sister hidden in smaller Dream Worlds across the area. They then explore the area, solving puzzles and encountering Seabelle, Seatoon and Seabury, all of whom give Mario and Luigi the necessary Dream Eggs. Returning to the main Dreamy Driftwood Shore area, they use these to expand the Dream World and hide Princess Peach. After navigating the area and defeating the Elite Trio, Mario and Luigi leave the area for a short time. Later though, they return to the area to find a piece of the Ultibed known as the Driftwood Jellyfish Sheets. They find them hidden in a pirates cave towards the north east of the area, but then have them stolen by the Fly Guy R thieves and have to get them back by fighting said thieves at Pi'illo Blimport. After this, the area isn't visited again in the course of the main storyline. Hirūne Bīchi Essentially "Nap Beach"; the name is a corruption of hirune (昼寝), meaning "nap"
French (NOA) Côte Lidodemer From côte (coast) and lit de mer (sea's stream bed). French (NOE) Plage Lidemer From plage (beach) and lit de mer (sea's stream bed). Part of Driftwood Shore's music is a cover of Gwarhar Lagoon, Oho Oasis's music from Mario & Luigi: Superstar Saga. This page was last edited on September 25, 2018, at 01:42.